Tucker Carlson’s only coverage of Republican Iowa Congressman Steve King’s racist comments  to The New York Times, published on January 10, that he didn’t know when terms like “white nationalist [and] white supremacist” became offensive has consisted of one segment of Carlson reprimanding MSNBC’s Nicolle Wallace for saying that racists attach to the Republican Party. 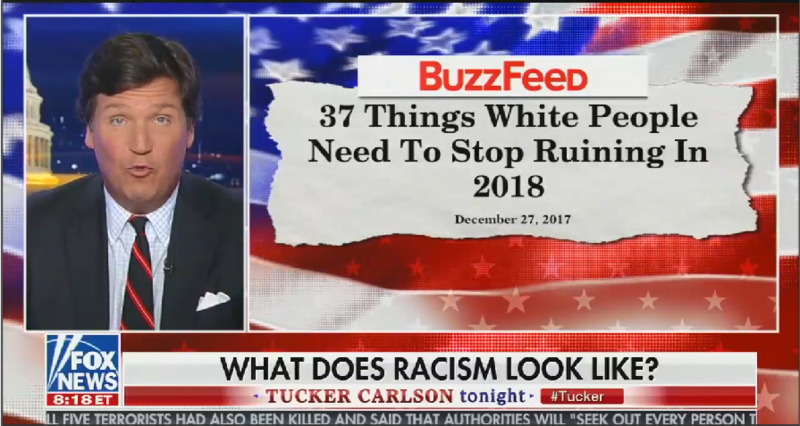 After critiquing Wallace, Carlson made his case that white people are the real victims of racism, citing evidence such as an affirmative action lawsuit  bankrolled by big money conservatives and a Buzzfeed listicle  from 2017 . Carlson has not mentioned King by name since the Times story broke, and he interrupted his guest Victor Davis Hanson when Hanson brought up King's name. Carlson has a long history  promoting white nationalism . He has used his Fox show to promote racist dog whistles  and elevate fringe issues  that are important to the “alt-right”. His nightly show has a robust fan base of racists and neo-Nazis , who regularly sing his praises online. Carlson's on-air racism has contributed to a massive advertiser exodus .